SNAFU! : THE AERMACCHI M-346FA: Multirole Master....future best seller? THE AERMACCHI M-346FA: Multirole Master....future best seller? The M-346FA, the low-cost multirole master, was developed from the M-346's AJT advanced training version already in service with the Italian, Israeli, Polish and Singapore Air Forces. In comparison with the latter, the FA version's unique features consist of the upgraded avionics and the two additional wing tip hardpoints (seven in total) in order to have two air-to-air missiles, maintaining at the same time the full dual role capability and the entire extremely advanced Integrated Training System. 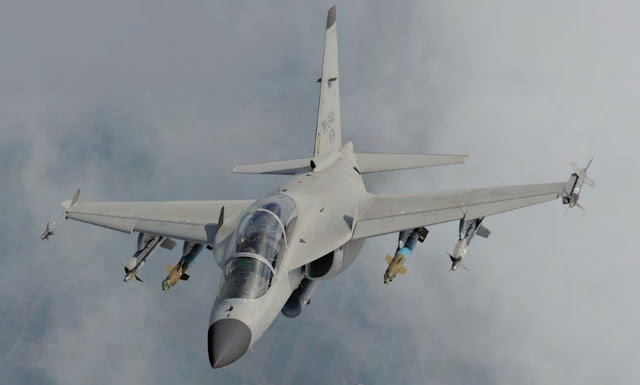 The M-346FA will be equipped with a DASS (Defensive Aid Sub System) self-defence system, which includes a Radar Warning Receiver, a Chaff and Flare dispenser as well as a Missile Approach Warning System, with six sensors and a comprehensive 360° protection against any missile threat. The aircraft will be safely able to exchange in real time all the tactical data thanks to a dedicated Tactical Data Link according to the NATO Link 16 or other standards. A key on board attribute will be the pulse-doppler multimode radar GRIFO-346, produced by Leonardo's Airborne & Space Systems Division. This radar is specifically optimised for the M-346FA and originates from the Grifo family that, with over 450 units sold worldwide, represents a great commercial success. The M-346FA’s cost per flying hour is 80% lower compared to a heavier and more expensive fighter used for close air support missions. Considering the cost of the F-35 and other modern fighters the light weight multi-role is gonna make a comeback. The M-346FA is one of the best examples but on a higher and a bit more costly plain would be the Gripen.